A halachic guide for kids to the laws of honoring parents! This full-color, wonderfully illustrated guide is perfect for teaching children the laws of kibud av v'eim (honoring one's parents). 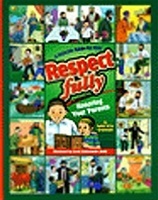 Each page demonstrates a different halachah, using clear, age-appropriate language. Stories from the Sages bring additional excitement to this book. 48 pp. Large format.